Welcome, Charles! Thank you so much for taking the time to answer a few questions today. Could you start by telling us a little about yourself and how you came to live with Lucy? I didn’t come to live with Lucy. Lucy came to live with me. I am a library cat, and proud of it. I love the library at night, but it can be a bit lonely after everyone has gone home at the end of the day. So, when Lucy got the job of assistant librarian at the Bodie Island Lighthouse Library, which came with an apartment on the fourth floor, I naturally decided that Lucy needed me to move into the apartment with her. So now I am a library cat by day and a house cat by night. Yes, I was named for Mr. Charles Dickens, a great man of letters, as I am a great cat of books. I don’t actually read books mind, but I find they are very comfortable to settle down on when left open on a table top. Like your mom, Lucy loves A Christmas Carol. She is also very fond of Great Expectations, and that is going to be the selection of the Bodie Island Lighthouse Library Classic Novel Reading Club soon. Busy, busy. I have to greet patrons when they arrive, join the children for children’s activities, allow lonely old women to fuss over me, keep mice out of the cupboards, and advise Lucy NOT to wear that hideous dress for her date with Connor. Or is it Butch this time? I get confused. What kinds of trouble do you and Lucy get into in By Book or By Crook? When the chair of the library board is murdered and then priceless Jane Austen first editions begin disappearing, things look bleak for the future of the Bodie Island Lighthouse Library. When the ruthless killer traps Lucy in the library at night, I… well, you’ll have to read the book to find out, won’t you? Do you help Lucy solve the mystery in any way? I would if she’d let me. I told her and told her that…. Well, not to mention any names, but that person wasn’t to be trusted. But does she pay any mind to me? No. Humans, they think they know it all. Cat to cat: do you have a favorite treat, toy, and nap spot? Nothing I like better than a party at the library, unless they shut me in the broom closet that is. The staff tell guests not to feed the cat, but no one pays any attention to that. Smoked salmon canapés are my favourite and I do like the one-bite crab cakes. The best nap spot is the lap of a little one when the children are upstairs listening to story time. It’s going to be interesting times at the Bodie Island Lighthouse Library with Lucy on the premises. Perhaps one day she’ll stop acting so darn human, and listen to what I tell her. I am, after all, an excellent judge of character. Blurb: For ten years Lucy has enjoyed her job poring over rare tomes of literature for the Harvard Library, but she has not enjoyed the demands of her family’s social whorl or her sort-of-engagement to the staid son of her father’s law partner. But when her ten-year relationship implodes, Lucy realizes that the plot of her life is in need of a serious rewrite. Lucy has just moved to North Carolina's beautiful Outer Banks for her new job as assistant librarian at the Bodie Island Lighthouse Library. Not everyone is happy about her new job, though, including the chair of the library board who ends up murdered during a reception to celebrate the arrival of a complete set of first edition Jane Austens. Then the rare and valuable books start disappearing, one by one, in the order they were written, and the Lighthouse Library's future is in serious jeopardy. Every single character in this book is a delight, from Lucy and her co-workers at the library to a wannabe librarian to suspicious rare book collector Theodore. I am completely jealous of Lucy's cozy 4th floor lighthouse apartment (which comes with all kinds of cool ghost stories!) and my mouth watered at the delicacies served at her cousin Josie’s Cozy Bakery. The mystery is a total page-turner with loads of twists and turns, plus there's a hint of a possible love triangle in the air as well! And the ending reminded me of a delicious gothic novel with Lucy trapped in the lighthouse with the killer as a storm rages outside. This is a debut not to be missed, and thankfully the wait for book 2, Booked for Trouble, won't be that long. It's already on my calendar for September! I am so excited for this series! I work at the library, and this sounds like a wonderful setting and such a great mystery plot. The mom thinks this looks like an interesting book...an series. Great interview of Charles, Truffles. I grew up listening to the foghorn from Splitrock Lighthouse in MN so I have a soft spot for lighthouses. This sounds like a terrific series! Don't enter me, but I enjoyed this book and I can't wait to read the next one. Pretty book cover. Sounds like a great book. Great interview! Sounds like a good read too. Sounds like a great book! I'd not only enjoy the mystery, but I love ghost stories as well! Amazing how stupid one can get with multiple pages open. The deleted post went to the wrong page. I love reading new cozy series, and I'm a sucker for cover art that has cats and light houses. I'd love to win a copy of this book simply because neither of my nearby county libraries (Brookyn and Queens) have any plans to order this book. A lighthouse library and a wonderful cat? What more could we ask for? new series are always very exciting! - Crepes. My mom used to be a librarian and instilled her love of books in me. I love the cover and really enjoyed the interview! Thanks for the chance! A lighthouse library, very cool idea. Great interview Truffles! I foster cats and have 6 of my own. So I Love Truffles!!!! I will be reading this book and series Thank s for Giveaway!!!! I love the setting of a lighthouse library---and a cat is a must for a good cozy mystery. Thanks for the interview, Truffles. added to my Wish List!! 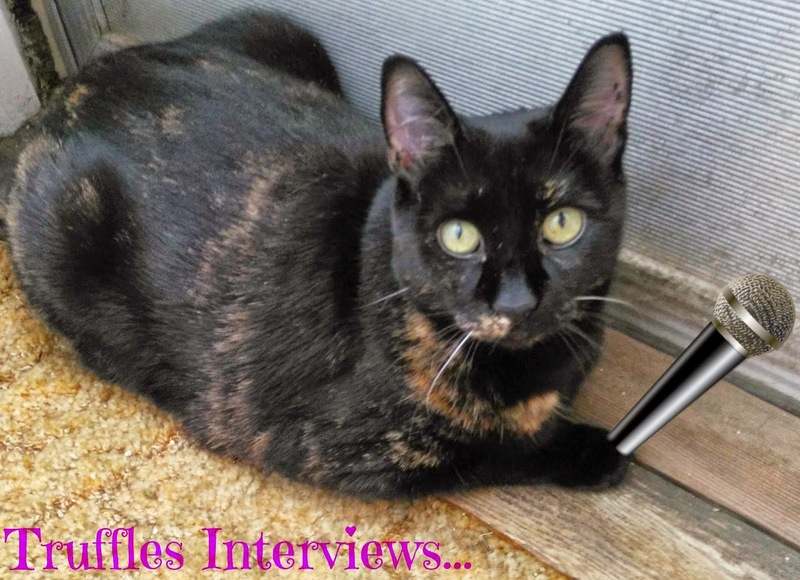 Truffles is a very insightful and entertaining interviewer! I am looking forward to this new series, thanks for the chance to win! I've been reading so many good reviews of this book, I would love to win! Thanks everyone for your comments. This was a fun book to write and I am so excited about it. Thanks to Truffles for the great questions! Thanks, OnePony! I hope you enjoy the book. Thanks, Cyn. Hope you enjoy it. I adore the cover, and can't wait to see what they come up with for the next book. Do you live in Canada, Austin? French bulldogs? Charles isn't so sure about that! You'd always have something to read. How mean of them. Thanks for entering. Thanks, Angel. I hope you enjoy the book. Salmon canapes? Crab cakes? I am SO comin' to visit you at that library. Sivvers... PREPARE THE TELEPORTATION DEVICE. There are yummy snacks in the offin'.